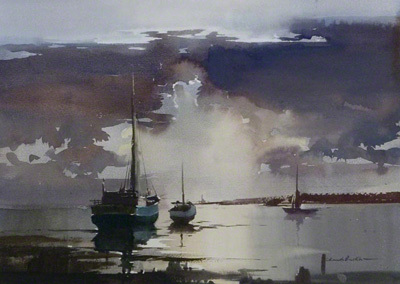 Ebb Tide a water colour painting by Claude Buckle. A water colour painting of the sea entitled Ebb Tide. This picture is particularly striking because of cloud formation shown over the boats anchored in the bay. Claude Buckle painted this scene more than once. We believe that this is the original picture. Courtesy Somerset Fine Art. Created in 19.